It all started with a three point shot at the end of one of the ugliest basketball games ever seen. OU guard Terrell Everett stuck a dagger in the heart of Texas A&M during the final seconds of their game on January 14th to seal a 45-44 OU win. Last night Everett burned the Aggies again with a late steal and dunk that capped OU’s fifth consecutive win 71-63. 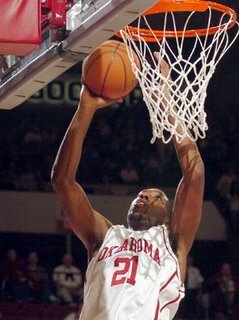 The shot that Everett made in College Station gave the Sooners shooting confidence that has helped turn this team into a team that mirrors the one Sooner fans thought they would see at the beginning of the season. Teams are getting killed by focusing solely on stopping the Sooners inside game while leaving OU’s struggling guards alone. Bobby Knight learned this lesson the hard way when Michael Neal bombed Texas Tech with four late treys. Rick Barnes suffered the same fate when Everett went off for 25 points Saturday night to stun the #4 ranked Longhorns 82-72 last Saturday night. It’s not that the Sooner guards were bad, they were just injured. Freshman guard Austin Johnson and junior sharp shooter Michael Neal suffered nagging injuries and are now regaining their health. Suddenly it’s not as simple to game plan against the Sooners. OU has been solid on defense all season and now opponents have to give special attention to the red hot Sooner guards giving Kevin Bookout and Taj Gray more freedom to create havoc inside. I believe it is too late for the Sooners to win the regular season conference title but OU has put themselves in position to content for a first round conference tournament bye and then make some noise in that tournament and on into the big dance.